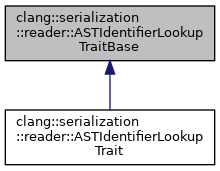 Base class for the trait describing the on-disk hash table for the identifiers in an AST file. This class is not useful by itself; rather, it provides common functionality for accessing the on-disk hash table of identifiers in an AST file. Different subclasses customize that functionality based on what information they are interested in. Those subclasses must provide the data_type type and the ReadData operation, only. Definition at line 131 of file ASTReaderInternals.h. Definition at line 133 of file ASTReaderInternals.h. Definition at line 135 of file ASTReaderInternals.h. Definition at line 134 of file ASTReaderInternals.h. Definition at line 136 of file ASTReaderInternals.h. Definition at line 884 of file ASTReader.cpp. Definition at line 138 of file ASTReaderInternals.h. Definition at line 153 of file ASTReaderInternals.h. Definition at line 149 of file ASTReaderInternals.h. Definition at line 898 of file ASTReader.cpp. Definition at line 889 of file ASTReader.cpp.